Saving electricity with joy for a better future. To save millions of units of electricity every year by designing & manufacturing innovative energy efficient motor control systems and super- efficient appliances that are a delight to the customers and offer long lasting values. To conduct our business ethically such that it is beneficial to our employees, suppliers & shareholders. We are committed to design, manufacture, sell and service motor control products and super-efficient appliances that exceed customer expectations. Monitoring the effectiveness of objectives and their related strategies. Conforming to all the applicable statutory and regulatory requirements. Adhering to ethical and fair practices that are beneficial to all stakeholders. Motivating each other to work as team. 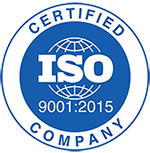 Our quality system is in accordance with ISO9001:2015. Versa Drives is a brand name of Versa Drives Private Limited for its Motor Control Products. Versa Drives was created by Sundar and Durga with a passion to excel in the field of motor control. They are backed by a strong and dedicated team of engineers who have experience in hardware & software development, BLDC & PMS motor design & development, simulation, testing and manufacturing. The factory is located at Coimbatore, an industrial city in India.